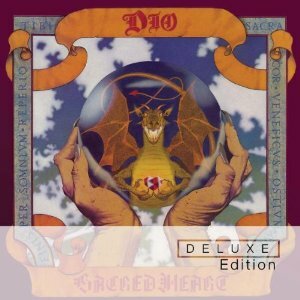 Three of the Dio albums - ‘Holy Diver’, ‘Sacred Heart’ and ‘Last in Line’ are being re-released this month. As well as a re-mastered version of the original album, these reissues each feature a bonus CD containing lots of extra material including B sides, the EP and live tracks. There is also an expanded booklet with notes from Malcolm Dome. The reissues have been endorsed by Ronnie’s widow Wendy Dio. As with the other two albums being released at the same time, the album itself is sounding better than ever thanks to being re-mastered. Featuring some classic songs - King of rock n roll, Sacred Heat, Rock n roll children, and Hungry for heaven amongst others, this is still a top class album and an essential part of anyones album collection. The bonus material on the second CD includes "Hide the Rainbow" from the Dio EP, as well as some B sides, and Intermission - available here for the first time on CD. A great purchase for any Dio fans. Sacred Heart Deluxe edition is available now.